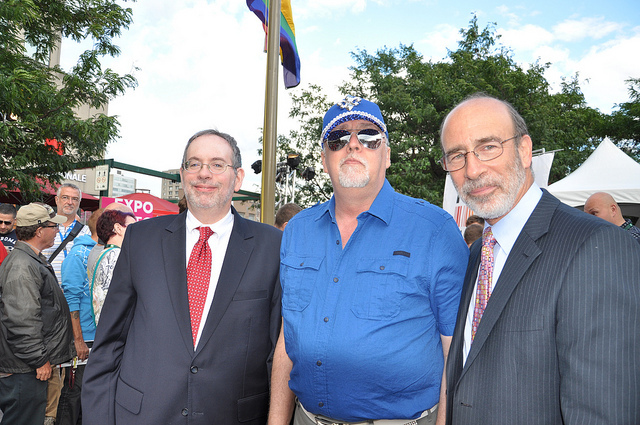 Gilbert Baker, the creator of the Pride Flag, attends a flag raising ceremony at the US Embassy in Canada with Consul General Andrew Parker and Deputy Chief of Mission Richard Sanders. Photo: US Embassy Canada | FlickrCC. We’ve all seen the LGBT pride flag, with its broad, bold rainbow stripes. Whether flown in front of inclusive churches, progressive schools, or draped around the shoulders of activists, it’s instantly recognizable. This worldwide recognition surprises Gilbert Baker, the San Francisco artist who came up with it in 1978 for the San Francisco Gay Freedom Day Parade. He made the world’s largest flag in 1994 to commemorate the 25th anniversary of the Stonewall Riots in the rainbow colors of pride. Many variations on the rainbow designs have been made over its nearly 40-year history. Some were designed to express the diversity found in LGBT communities. Another version of the rainbow flag has the addition of a black strip to memorialize the many lost to AIDS. But other variations, important ones, have always suffered from low visibility, leading to few people understanding them when they see them. The bisexual pride flag was designed in 1998 by Michael Page to increase the visibility of bi people in the LGBT community. Three stripes—pink and blue with purple in the middle—represent the way bisexuality is often viewed as an overlap between straight and gay. Several flags fly for the transgender community. The most common is the Transgender Pride Flag, showing five stripes of light blue, pink, and white, representing trans men, women, and intersex people. The original of this flag, made in 1999 by Monica Helms, herself trans, hangs in the Smithsonian National Museum of American History. Other flags designed by the trans community feature either a spectrum of stripes from blue to pink or the symbols for male, female, and intersex, either interlocked or conjoined. The asexuals, while often left out of the LGBT discussion at large, only found a codified flag as recently as 2009. Their flag, taken from online forums by a group entering into the San Francisco Pride Parade, is four stripes: black, grey, white, and purple, to represent the variations of asexuality and aromanticism. The LGBTA communities need their symbols for the same reason any nation or culture ever has; as a way to say we are here, on common ground, together.